Little siblings of Duck and Goose fans rejoice! 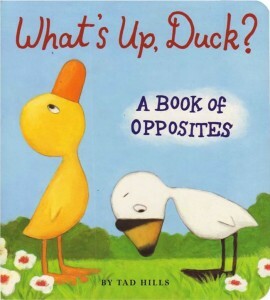 The stars of the bestselling Duck & Goose and Duck, Duck, Goose return in this board book for preschoolers, this time, to introduce basic opposites. Goose carries an ohso-heavy log, while duck easily balances a light-as-a-feather feather. Thistle is one fast bird, but Goose is slooo-w. And when Duck is sound asleep, Goose is wide awake. With a simple text and colorful illustrations–plus the inimitable characters, of course–here’s a wonderful, and humorous, introduction to an important concept.